Serving three-year terms, YALSA Board members are responsible for jointly determining YALSA’s current and future programs, policies, and serving as liaisons to YALSA’s committees, juries, taskforces and advisory boards. Members work year-round, and attend in-person meetings at ALA’s Midwinter and Annual Conferences. A full description of Board duties and responsibilities can be found here. You can learn more about ALA elections here. What best qualifies you for being Secretary? I have experience leading workgroups and also contributing to them. One of the best skills that I have is moving work forward and also being very organized—organizational skills seem crucial for this role. I am also interested in learning more about how boards operate and so this will be a good learning experience for me as well. How do you envision furthering the mission of YALSA as the Secretary? The thing that I love most about the YALSA mission is keeping teens front and center. As the Youth and Family Services Manager at The Seattle Public Library, my charge is to represent the interest of youth and families throughout the system and I hope to do the same on the YALSA board. I think a lot about opportunity gaps that youth and families face throughout the country, YALSA can contribute to closing opportunity gaps by supporting library staff to understand community needs and help support community. I am really excited about the continuing education plan, I think that piece is a challenge for library systems all over the country and YALSA has really stepped in to support this work. I believe that all decisions, programs, systems and structures need to be designed to help youth and families succeed. In order to do that, we need to help library staff regardless of the size of the library or location strategize and develop a plan to further that mission. We also need to prioritize black, indigenous and youth of color and the intersectionalities that make up their diverse identities and help support library staff to put these teens first. I think I have a diverse background, I have been a teacher, teen librarian, program manager and now a youth services manager. Also, I am uniquely positioned based on my equity, diversity and inclusion work in Seattle to support YALSA in moving forward on their EDI statement and new strategic plan. 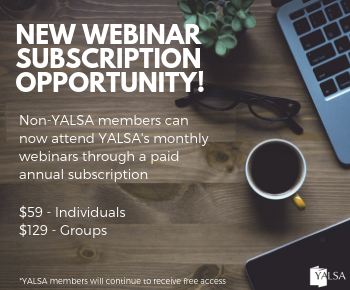 By admin March 3, 2019 March 12, 2019 Committees and Volunteer Opportunities, Election, Governance, YALSA Info. Get ready to vote in this year’s YALSA election! To help you make informed decisions, we’re sharing interviews with each of the 2019 YALSA Governance candidates. Voting will take place from Monday, March 11 through Wednesday, April 3. To help you further prepare for the election, be sure to listen to the recording of the YALSA Candidates’ Forum from March 7th! I thrive on creating meaningful change in our local and state library communities, and I look forward to utilizing my vision, experience, and expertise in enacting meaningful change for librarians and most especially for our young people across the United States. I wish to use my years of experience as a leader of a non-profit organization combined with my leadership experience at the state and local library levels to lead YALSA into the future as the next President-elect. How do you envision furthering the mission of YALSA as President-elect? 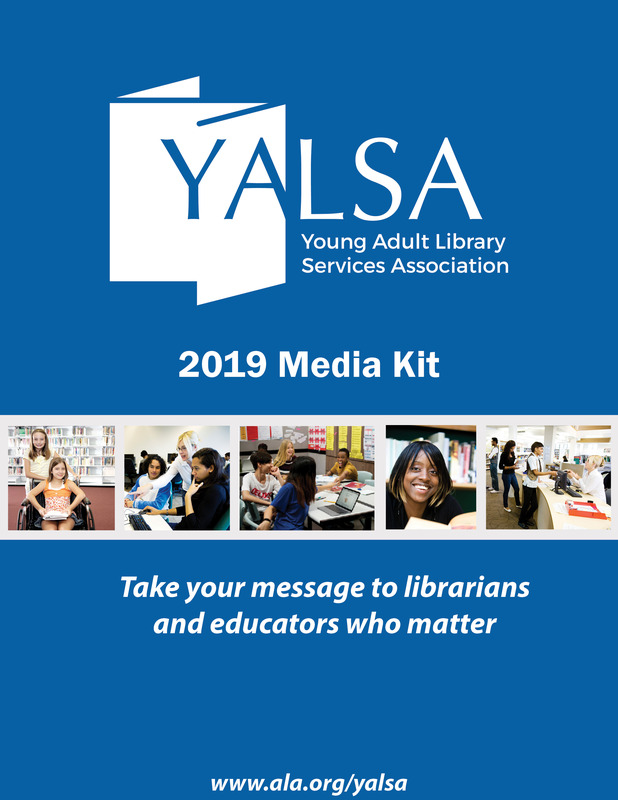 Through the resources of YALSA, I will work to educate librarians around the US and world on how to best empower and give voice to our young people. I will strive to ensure that the needs of our young adult librarians and young adults in general are being best served by the American Library Association. I am a firm believer in the power of teens to articulate their own needs; therefore, I will make a push to establish a national teen advisory board comprised of young people from diverse backgrounds around the country. 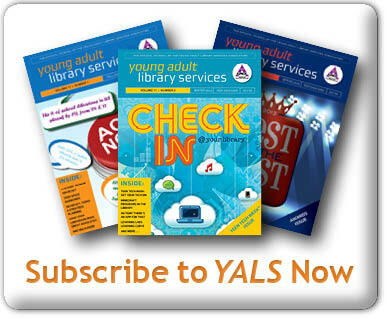 There is so much great information on the YALSA website that serves to make me a better teen librarian. I will work with our board in an effort to better disseminate that information to our membership and to those who work with teen populations. 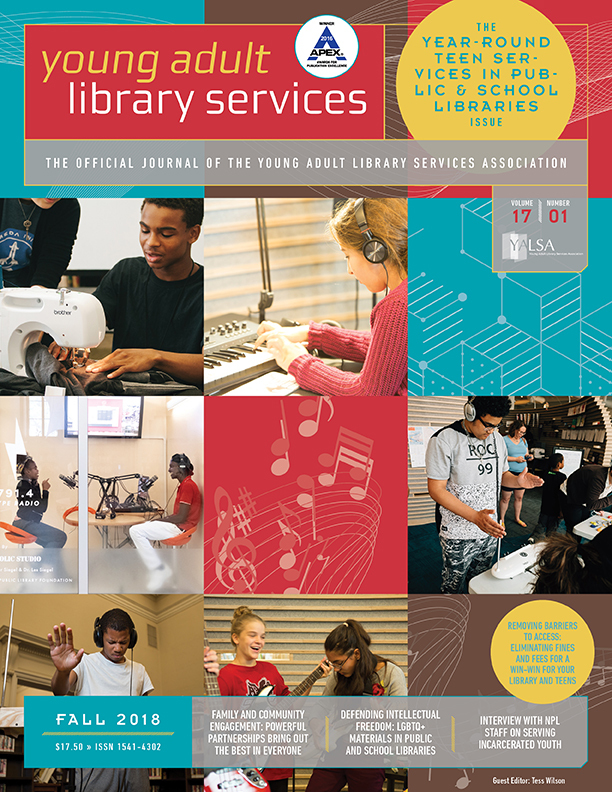 I’m most excited by YALSA’s Mission and Vision: Mission: Our mission is to support library staff in alleviating the challenges teens face, and in putting all teens ‒ especially those with the greatest needs ‒ on the path to successful and fulfilling lives. Vision: Our vision is that all teens have access to quality library programs and services ‒ no matter where they occur ‒ that link them to resources, connected learning opportunities, coaching, and mentoring that are tailored to the unique circumstances of the community and that create new opportunities for all teens’ personal growth, academic success, and career development. I want to see more libraries reaching out beyond their walls to the teens in their communities. We must meet our young people when and where they are. As I stated, I think it is of utmost importance that we add actual teen voices to our work. 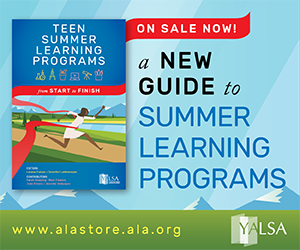 The formation of a National Teen Advisory Board for YALSA would be a major step in that direction. As we witnessed in this past year with the Parkland students, teens have the abilities and skills to lead. As librarians, we can help facilitate and guide them on their journeys. I have proven leadership skills in both the for-profit and non-profit worlds. I ran a successful French bakery and cafe for 10 years before becoming a librarian. I headed a non-profit board and led the organization from the brink of being disbanded to becoming a thriving self-sustaining community organization. I look forward to sharing my skills and expertise with YALSA as we boldly move forward into the future. Thank you for your consideration and your vote!